State of the Union: How Can We Assess Donald Trump’s First Two Years in Office? Michael Nelson is the Fulmer Professor of Political Science at Rhodes College, a Senior Fellow at the University of Virginia’s Miller Center. 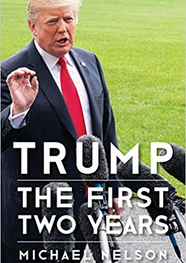 His latest book is Trump: The First Two Years (University of Virginia Press). 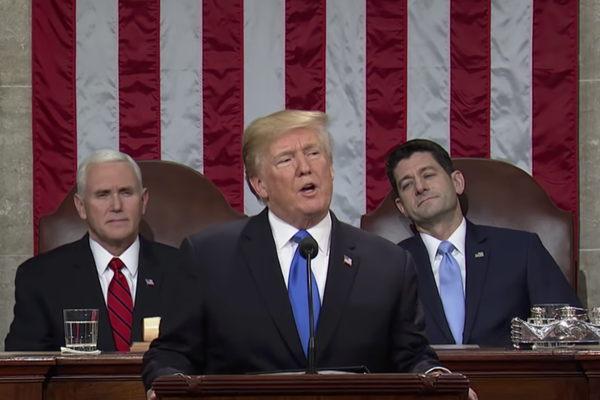 On the morning of the State of the Union address, how can we assess Donald Trump’s first two years in office without being tainted by ideology? In Trump: The First Two Years, just published by the University of Virginia Press, I try to do so from the perspective of more than two centuries of presidential history. In the past, presidents almost always have become more effective during the first half of their first term. Through what amounts to on-the-job training, they learned how to perform a role for which no previous position can prepare one. At the same, presidents typically become less influential. Although each decision they make may gratify some people, it’s bound to disappoint others. Over time the accumulation of decisions costs the president more in the form of disappointment than it gains in the form of gratitude. Trump has defied these patterns. If anything, he was even less effective in 2018 than in 2017. Instead of learning from the experience of being president, he reverted to what he was long before he took office. He became more Trumpian, both in his operating style and policy preferences. With growing but unwarranted confidence in his own ability, Trump banished advisers like Secretary of Defense James Mattis and White House Chief of Staff John Kelly who restrained his impulses. He replaced them with new advisers who confirm him in his longstanding opinions, and trained those who remained to withhold advice or information he did not want to hear. The oft-quoted line offered by Trump’s more thoughtful supporters in the 2016 election was that he should be taken “seriously but not literally” when he talked about immigration, foreign trade, Russia, and other matters. As Trump begins his third year in office it has become necessary to take him literally. He really believes—and is increasingly willing to act on this belief—that although we are in every way the most powerful nation on Earth, the rest of the world is taking advantage of us. Yet for all his decline in effectiveness, Trump has not become less influential. To be sure, his standing with the public is low, never approaching 50 percent approval. But it’s been low from the start of his term and has not sunk much further. Trump’s base of supporters has become, if anything, even more solid in its devotion to him. As for his influence in Congress, Trump has gotten little in the way of legislation—but he also asks for little. Yet as with his voter base—indeed, because of his voter base—Trump’s support among Republican members has solidified. Critics like Tennessee’s Senator Bob Corker simply left Capitol Hill. “It’s becoming a cultish thing,” Corker lamented. Losing the House of Representatives to the Democrats in the 2018 midterm elections was a blow because it increases the likelihood of impeachment. But with congressional Republicans squarely in Trump’s corner the prospects of removal by the Senate are vanishingly small. That may remain true even if something like a “smoking gun” emerges implicating Trump in one or more criminal offenses. Other recent presidents who were either forced to resign (Richard Nixon) or impeached (Bill Clinton) had to make their case to the voters through the mainstream news media. Losing the Senate in 2018 would have been a different matter for Trump by denying him his greatest area of ongoing accomplishment: judicial appointments. These include Memphians Tommy Parker and Mark Norris of the federal district court of West Tennessee, 30 appellate court judges (a record), and two Supreme Court justices. But instead the GOP increased its ranks in the Senate from 51 to 53, making the party less vulnerable to one or two defections on close confirmation votes. As for the president’s prospects for reelection in 2020, the composition of the two-dozen-plus field of potential Democratic challengers may be the best thing going for him. The Democrats’ roster skews far to the left, with all the pressure from the party’s activists pushing candidates even further in that direction. Center-left consensus builders like the only three Democrats to actually win a presidential election in more than half a century—Jimmy Carter, Bill Clinton, and Barack Obama—are far down the list in the emerging field of contenders. In all, Trump is what he was when we elected him: impulsive, braggadocious, ignorant (but far from stupid), cunning in some matters but gullible in others, open to flattery, insistent on loyalty bordering on devotion, enamored of Russian leader Vladimir Putin and other global strong men, incapable of rhetorical uplift but a brilliant verbal counter-puncher. He’s also bored with substance but obsessed with image, tribal in tending his base of supporters, and convinced that the United States is always getting screwed, especially by its allies. Looking beyond 2020, the deeper question is: Will Trump’s leadership style—threatening the press, rubbing his supporters’ sores and turning Americans against each other, sacrificing American values such as liberty, equality, and the rule of law on the altar of blood-and-soil nationalism—be emulated in an ever more bitterly polarized political environment, or will it induce voters and political leaders to pull back from the brink? In other words, is Trump an aberration or does he portend a new and harsher style of presidential leadership than his 44 predecessors have offered since 1789? The reassuring answer lies in that long history. However aberrant and dangerous Trump or his successors may be, the original Constitution’s system of “separated institutions sharing powers” and the First Amendment’s protection of freedom of speech, assembly, and press remain no less resilient a safeguard of the Republic than ever. For as long as political power is sliced and diced among the three branches of the federal government, between the federal government and the states, and between all the institutions of government and a free people and free press, the constraints on how much good or harm a single person can do will remain. If you enjoyed this piece from Michael Nelson, check out his latest book!